If you haven’t yet checked out Acustica Audio’s Nebula VST plug-in, i highly recommend it. Read my comprehensive Nebula review. For those of you that are using the plug-in, and would like to get the very best sound quality from it, the good news is that there are various tweaks that can be applied to do just that. The best tweak to my knowledge is altering the way that the plugin plays its various kernels for each individual program. What Is A Kernel In Nebula VST, And Why Would I Want To Alter How It Plays? If you have used a convolution reverb you will be familiar with the term ‘impulse’. In the case of a reverb program it is a static snap shot of a room’s reverb taken by making a recording of the room in the real world. You can think of Nebula’s kernels as impulses, but there are a lot more of them and they record much more data about the sampled hardware. This is also known as ‘direct convolution’. It is very CPU intensive, but more accurate and produces better sound quality. How much better we will discuss later. This is a hybrid of the 2 modes. It is assumed that the main advantages of using TIMED mode is in the effect on the transients of the sound, the very first portion. It is in this first part that the listener hears many subconscious cues about all sorts of interesting aspects of the sound. It is also the part responsible for the punch of percussive instruments. OK, What Button Do I Press To Increase The Sound Quality!? Sorry, this is Nebula we are dealing with 🙂 Nothing is easy or straight forward. We need to jump through a few hoops first, but don’t worry, all the info you need is right here. We need to make a global settings change, and then alter each program one at a time. Nebula VST by default is installed in your DAW plug-in directory as 2 versions. Nebula and Nebula Reverb. Nebula Reverb is the same as Nebula but with higher quality, higher CPU use defaults. We of course use this version as a starting point. The .DLL file that is the actual program has a corresponding .XML file with the same name. This contains the settings, and this is what we will be modifying in a text editor. Yours may differ, they could be in Program Files/Steinberg/Cubase Studio 4/VSTPlugins/acustica… i am sure you can find them in whatever plug-in directory they live. So now you can alter your own preamp programs to run on TIMED kernels! Hit the save button to make the change permanent, or better still make a copy of the program first so you don’t mess anything up by accident. How much better is the sound quality in TIMED mode? I would like to thank all the forum members who contributed to this thread as they were the inspiration for this article. I can detect different things in different audio. I don’t want to put ideas in your head of what to listen for, but a subtle ‘tightening’ and little more punch is what i am mainly picking up. Its not massive, but if you are into sound quality and have a decent CPU well worth it for the 5 minutes it takes to edit the program. Please let me know in the comments below what differences you can detect, it would be very interesting. If you want to get deeper into this subject I highly recommend you check out my Nebula Explained Udemy course. There is a section devoted entirely to the Kernel page. If you found this article useful please consider joining the mailing list and/or clicking ‘like’ on the facebook box on the top right hand side of this blog. THANKS. Love the guide. Real Helpful! Thanks for the tutorial, really appreciate it! However – when I downloaded the zip-file and listened to the two files, I couldn’t hear a difference, not with my headphones either. So I imported the two files into Audacity the ‘Nebula_Clean_FREQD_Kernel’ on the first track and the other’Nebula_Clean_TIMED_Kernel’ on the second track. Then I inverted the ‘Nebula_Clean_TIMED_Kernel’ (Effect > Invert) and pushed the play-button – no sound at all. Ergo they null sum, or in other words – as far as I know, the two files in the zip-file are identical. I think that by accident you have put two identical files in the zip-file, and I’m interested in hearing the difference between the FREQD version and the TIMED version. I also did the same test on the original file (which I think you posted at the Nebula forum?) with the FREQD file – and they didn’t null sum, ergo they are different. Conclusion: I think there are two identical files in the zip-file, not two different. But I don’t know if it’s the FREQD or TIMED version?! Can you please check on this? Thanks for writing, i am very happy you like the tutorial! I am not familiar with Audacity, but understand exactly what you are trying to do to measure the difference in the files. Load the 2 files to compare (as .WAV’s) into the Input A and Input B slots and select the A-B option. Now you can see where the difference is in frequencies and hear it. I’ve been putting Timed on all my programs. However I am perfectly able to use both Even and Odd on every program. Also, the DSP increase is extremely minimal, at least on my machine. I can typically run about 15-20 instances of Nebula in my sessions, and with Timed I can still run about 14-18. My computer is not overly powerful either. The specs of my computer are actually far below even a modern laptop, so if the Timed kernels barely makes a dent in my CPU on this machine, I doubt it will make a difference on most other modern machines. I set my timed to Clean, Even, and Odd, maximum time, maximum kernels, my Rate CNV is maxed out, my L Timed and FREQD are maxed out, and my Quality setting is set to the maximum of 5, my sample rate is 96kHz, and my bit depth is 32-bit floating point. I should also let you know I am running Nebula 2, as I do not own Nebula 3. So if I can max out all those setting on Nebula 2 with a mediocre computer and still handle 14-18 instances, I really don’t think DSP is an issue. Also, my computer is not overclocked, but I plan on doing so sometime in the next few weeks. I’m hoping I will be able to run 30-ish instances. I am very happy you like the article! It seems very popular. The ‘quality’ setting is bad news! It does not work properly and can create clicks in mixdowns. I used it myself for a while and found out the hard way, took ages to track down the problem. Turn if off. What would be really nice is if nebula had an option to switch to the highest quality settings automatically at mixdown. That would allow us to mix at lower quality settings with reasonable demands on cpu and then use the high quality settings for the final render. I dont mind letting things churn overnight once im happy with my mix. 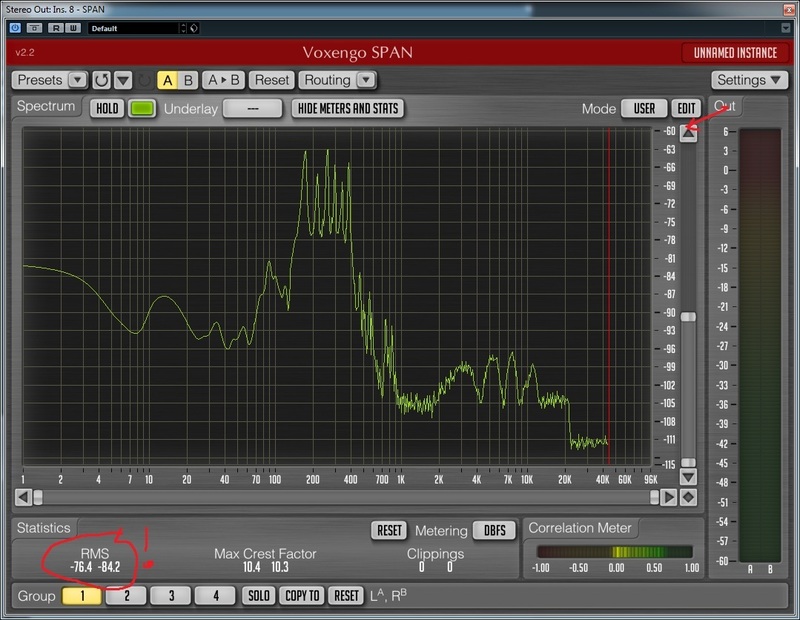 The two FLAC Example Files are “the same” The difference are in the inaudible range below -60 db. maybe it doesnt work with the bongo loops. otherwise there is no practical difference between freqd and timed mode. Thanks for your comment foxman, I agree the difference is small, but would disagree that the range below -60 dB is inaudible. Depends on the noise floor in your studio and quality of monitoring. I am reading forum posts by a lot of people saying that they are getting improved ‘punch’ using TIMED. It is possible that this is a strange cognitive bias brought on by reading other people are hearing it, but unlikely. Everyone must do their own ABX to decide for themselves. My bongo loop example is just one preamp on one sample. It does prove at least there is a difference, so if people can hear it or not is another matter. A great article collating lots of useful information.. I do think its important however that you credit you sources. This is not info you have discovered. Other Acustica Forum users (Timp and a few others) collected this knowledge and I can imagine if you continue to write articles without giving credit where credit is due then the real pioneers of this amazing software will keep new knowledge to themselves. That aside, I think a real in depth manual for Nebula should be developed (you could be the man for it) and the database work you have down is excellent. Hi, glad you like the article and the database. Whoaaaaaaaaaaaaaaaaaaaaaaaa!!!!!!!!!!!!!!!!!!!!!!!!!!!!!!!!!!!!!!!!!!!!!!!!! Anyone who cannot hear the VERY CONSPICUOUS difference this makes, I advise you to invest in a good monitoring situation (room treatment and good monitors). This is ASTONISHING. One thing that may become a problem because of this switch are the existing sessions you may have with Nebula already on them (and un-bounced). You may have a problem because these awesome settings change the sound of the files almost fundamentally (in terms of character); with my AlexB 4KD, for example, this switch softened the hell out of the highs, made the transients punchier (and tighter), and to top things off, it made everything sit SO MUCH BETTER in its own space. Now that’s just with this AlexB compressor on the master fader alone. Imagine all my other disparate types of libraries! WHAT WILL THESE SETTINGS DO TO THEM!?!?!? Holy HELL! Thanks so much for this! I’ve been using the FREQD this entire time! I agree with Elucidation. I have mastering grade monitors (ADAM A7’s) and mastering grade converters (Metric Halo) and i to can hear the difference. Timed mode is more clear and open. Freq mode is more crunchy. is another problem with this VST, I use Cubase and when using the VST procesoru is full, I can else has used, so that you can try a demo to figure out if it’s worth buying , I think that soft and the Library’s not worth the money , it costs a lot of money and you can not use it because you work full procesoru and have problems from the system, without having to open or insert of other VST ins or virtual instruments, I have an i7 with 16 gigs fell to memory so ……….shame it’s not designed properly, it sound great and work even better, as are actually professional VST……………..I’m curious who designed a muzicican or an engineer? ))))) big difference between them what you think ? Thank you very much for the tutorial, clear and very helpful! My question is, do I need to increase the FREQD millisecond values to their maximums too, or just leave them at the default 50ms? I don’t have this program, but this will be the maximum if that is as high as it goes. >> My question is, do I need to increase the FREQD millisecond values to their maximums too, or just leave them at the default 50ms? If you are running a kernel in full TIMED mode (not SPLIT mode) then it doesn’t matter what the FREQD setting is for that kernel, it won’t be doing anything. I would leave it otherwise. might be a good choice. I am glad you like my video, thanks! ← How Authentic Is Analog Synth Emulation In VSTi?